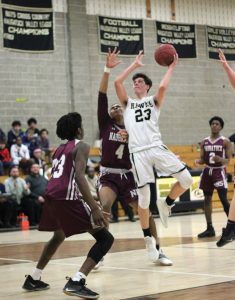 BEACON FALLS — The turning point in the Woodland boys basketball team’s season may have come just in the nick of time. 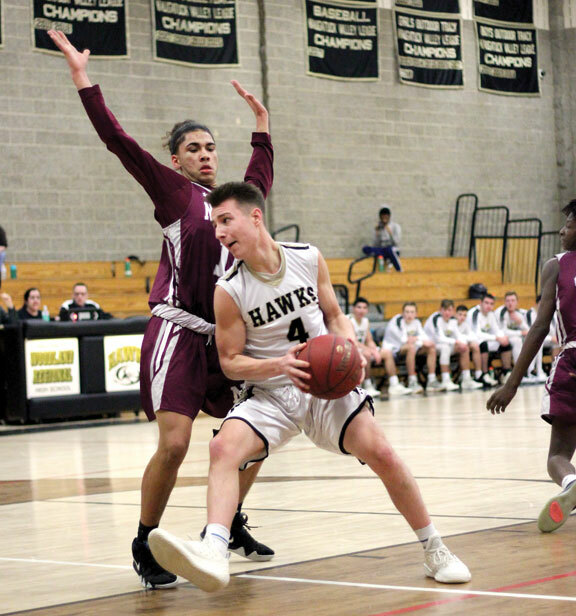 During a Feb. 1 game against rival Naugatuck — one the Hawks eventually lost, 63-43, to fall to 4-11 on the year — Woodland coach Tom Hunt felt as low as any feeling he’s experienced during his dozen years in the Woods. Woodland faced a 36-18 deficit at halftime after a lethargic effort during a point in the season when the Hawks urgently needed victories to reach the state tournament. To their credit, the Hawks responded to their coach’s message. They played the Greyhounds much more tightly in the second half, and that momentum helped Woodland reel off three straight victories the following week. Consecutive victories against divisional opponents put Woodland in position to challenge for a state tournament spot during the final week of the regular season. The Hawks knocked off Oxford, 72-64, on Feb. 4, Derby, 64-48, on Feb. 5 and Seymour, 68-58, on Feb. 8 to improve to 7-11. That leaves games against Wilby (Monday) and Wolcott (Thursday) on the slate. One victory in the final two games will send Woodland to the Division IV state tourney. The three straight victories snapped a six-game losing skid for the Hawks. In the Feb. 4 win at Oxford, Woodland rallied from a 34-28 halftime deficit. Zach Bedryczuk netted a game-high 28 points with five 3-pointers, and Mickey Meier (14 points) and Jason Palmieri (11) also reached double-figures. That trio replicated the feat the following night against Derby. Bedryczuk led the way with 20 points, while Palmieri put up 16 and Meier added 12. Against Seymour, Bedryczuk led the Hawks with 26, while Palmieri and Meier added 13 each. Palmieri’s efforts down the stretch in his freshman season as point guard have gained Hunt’s notice. Hunt also praised Tyler Bulinski, the team’s sixth man who totaled 17 points over the four-game stretch. Wilby entered the final week of the regular season with just one victory. Wolcott, which entered the final week with a 12-6 mark, would make for a tough home test if the Hawks need a victory to reach the state tournament. Still, Hunt remained confident and considered his squad a potential sleeper if it reaches the postseason. Editor’s note: This story has been updated from the article published in the Feb. 14 edition of the Citizen’s News to include information on games played after press time.